You are here: Home / Information for Beekeepers / How To.... / Swarm Catching: A Fun [Club] Opportunity? Swarm Catching: A Fun [Club] Opportunity? 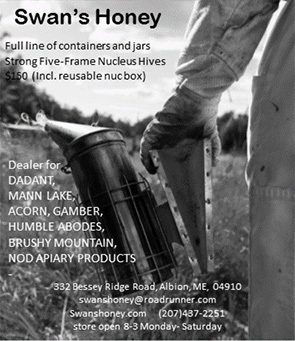 We’re now just a month away from the kickoff of our honey bee swarm season in Maine. With a little preparation, and the right attitude, we can have fun rescuing some of Mother Nature’s most healthy, robust colonies. Without our help, they are probably in for a short lifespan as a feral colony in a small tree, your neighbor’s attic, or even worse, stuck out in the open come late fall. Last year, my phone started ringing on May 1st and by the end of May we had picked up, scooped up, gently placed and/ or marched single-file to a new home, seven strong honey bee colonies. A typical number of swarms that just got started two to three weeks early because of an early spring. As a good rule of thumb, be ready when the dandelions pop. A swarm on the ground will march into their new home with a little coaching. They were clustered together on a tree trunk, in a pile of leaves on the ground along a side street, snuggled on a “for rent” sign, or hanging out in the open on a small branch. Sometimes at eye level (the way we like ’em), sometimes 40 feet up in a tree (handy to have a brick tied to a length of strong twine), sometimes in a bait hive/ swarm trap (like we all should have in our bee yards). You look so talented to the onlookers when the bees just march right into their new home! Swarm catching is a great opportunity to have a positive impact on the public’s perception of the beekeeping community. We get to chat with people about the enormous benefit bees provide and show them that the bees can be handled in a safe, calm, and respectful manner. Every swarm will present you with a different opportunity to be creative as you consider how to best get them into the (temporary) tub or directly into a single hive body for transport. Just stand back for a moment think about the easiest way to get the bees into a new home. I have placed a hive body on a sheet on the ground directly beside a swarm cluster and scooped a couple of big handfuls of bees into the hive body containing empty frames and just watched the rest of the colony march on through the entrance into their new home. I have put a frame of drawn comb into a five-gallon bucket, duct-taped it to a long pole and raised it up under the swarm, jostled the branch so the bees dropped into the bucket, lowered the pole, covered the bucket with a screened lid and carried them to their new hive body. I have cut the branch and laid it and the cluster down into a transport tub/bucket/ cardboard box/hive body. Given it a shake or two to get the bees off the branch, taken the branch away and closed the screened lid. Now I know you must be thinking there is more to it than this brief description. Maybe if you saw it done, you would be much more comfortable with trying it yourself? Your local club could easily organize a swarm-chasers group that could match the experience of your fellow beeks with your interest! These new colonies could repopulate your yard and/or go to your club’s new “teaching yard.” What a great opportunity for your club to provide hands-on experiences for the new beeks to work with more bee, and a mentoring opportunity for the experienced beeks to learn from teaching others! Let’s get our clubs out of meeting rooms and into bee yards and have fun catching swarms!